In the market environment, the terms support and resistance are almost synonymous with demand and supply, respectively. Is the price level at which there is adequate demand to absorb all selling pressure which causes an asset to stop its downward price movement and (normally) turn prices upwards. Support causes the formation of reaction lows. Is a price level at which there is sufficient supply of an asset to satisfy buying demand, causing prices to halt a previous upward move and typically turn prices down. Resistance causes the formation of reaction highs. In an uptrend, both support and resistance levels rise. Typically, support levels hold, while resistance levels offer temporary halts to upward movements in prices. Resistance levels are repeatedly broken until the uptrend is reversed. In a downtrend, both support and resistance levels move lower. Typically, resistance levels hold while support levels temporarily stop down price movements. Support levels are repeatedly broken until the downtrend is reversed. Beware of round numbers! Technicians have discovered that prices often find support and resistance at round numbers. Round numbers act as psychological levels that stop advances or declines. For example, after first being broken intraday (but closing below) the level 1,000 level on the Dow Jones Industrial Average offered resistance for many years before it was finally penetrated on a closing basis. As a rule, don’t place trading orders or protective stop-loss orders at round numbers. In an uptrend, it is better to place buy orders just above the round numbers and stop loss orders just below. On the other hand, if you want to sell short in a downtrend, place your sell orders just below and your stop loss just above the appropriate round number. Round numbers are particularly important for short-term traders. 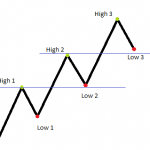 In an uptrend, resistance levels often become support levels after they have been broken significantly. In a down trend, the opposite occurs as support levels frequently become resistance levels. The greater the volume that occurs at a support or resistance level, the more significant the level is and therefore the more likely a candidate the level is for role reversal. The longer that prices trade near the support or resistance level, the greater the chance of role reversal. For example, the probability of role reversal is enhanced if consolidation occurs near a support or resistance level for a few days rather than a few hours. The more recently that trading occurred at the level, the fresher it is in traders minds, and the more likely it is that role reversal will happen.